Dr. Samuel A. Youngman Jr. 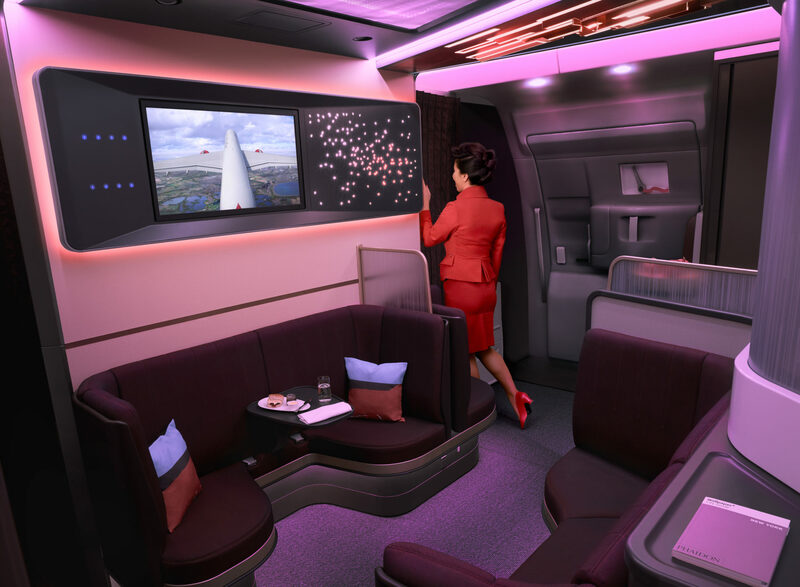 This week’s big reveal of the stunning Virgin Atlantic Airbus A350 interior represents the culmination of nearly four years of product evolution for the carrier. Virgin Atlantic VP of customer experience Daniel Kerzner, speaking to RGN on the sidelines of the A350 event in London, said the airline focused on customer research, product selection and customizing the CMF (colors, materials, and finishes) to create a distinctive sensory experience that also delivers pleasure with a warmer palette. London-based Factory Design aided in the development. The new Loft, which replaces the Virgin Atlantic onboard bar concept, is a welcoming and restful spot. A lobby-style social space at the entrance to the aircraft, it can also serve as a collaborative work space and is more inclusive than a bar. It’s expertly accented with Boltaron translucent thermoplastic. To gather more information on the lifestyle trends of its customers, the airline carried out several “innovation safaris” in the UK, New York and Dubai. The core Virgin Atlantic customer is a leisure traveler, Kerzner said, and the Virgin Atlantic brand is associated with key milestones and celebrations in passengers’ lives. But Virgin also serves its share of business customers, including the demographic of “hidden productivity travelers” – from entrepreneurs to freelancers – who may not fit the pattern of traditional business passengers. The airline’s tiered economy offering – economy light, classic economy and economy delight – has proven popular with customers, Kerzner said, and put the airline in a position to compete with rivals, from low-cost carriers to flagship airlines. Virgin Atlantic’s decision to buck the trend on doors in business class suites has more to do with the airline’s lifestyle positioning than anything else, Kerzner told RGN. The brand quality of warm sociability between passengers and crew drove the decision, but Kerzner also believes that this Upper Class product is more honest than it would be with a ‘make-shift’ door. Whatever side of the door argument you’re on, Virgin Atlantic’s suite also offers passengers plenty of light, with finishes that will play off the natural light coming from the A350’s large windows, cabin mood lighting and the personal mood lighting on the customized seat. The Virgin Atlantic product – ground to air – reflects a desire to keep customers’ established “brand love” going. “That people want to fly Virgin certainly comes through in terms of load factors and it comes through in the momentum that we have within our business, but most importantly it comes through in the love that people have for the brand,” Kerzner said. Kerzner told RGN that the airline ran anonymous contests, offering free tickets to New York on their preferred airline, with consumers revealing a strong preference for Virgin Atlantic.